Augusta Arsenal (1) (1816-1826, 1827-1861, 1861-1865, 1865-1955) - A U.S. Army arsenal established in 1816 after the War of 1812 in Richmond County, Georgia. The original site was abandoned because of unhealthy conditions and a new site was established 1827. The Federal arsenal was seized by Confederate forces in 1861 and held until the end of the U.S. Civil War in 1865. Restored as a Federal arsenal in 1865 and operated until abandoned in 1955. Augusta Arsenal Storehouse & Officer's Quarters c1903. 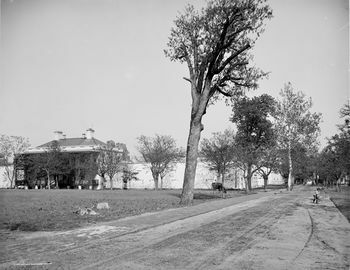 Augusta Arsenal Old Barracks c1908. The U.S. Army arsenal at Augusta was established in 1816 after the War of 1812. The original site near King Mill was along the Savannah River and had to be abandoned after a Black fever epidemic killed all but the Commander, Captain Matthew M. Payne, and one lieutenant. A new 70‑acre site was established 1827 and completed in 1828. The buildings on the original site were deconstructed, the parts numbered, and reconstructed on the new site. The new site had two sets of officer's quarters, a barracks and a storehouse all enclosed inside a loopholed wall. The first garrison was Company C, 2nd U.S. Artillery. The Federal arsenal was seized by Confederate forces on 24 Jan 1861, five days after Georgia seceded from the Union. Captain Arnold Elzey (Cullum 923) and his garrison of 80 men surrendered the arsenal. Command of Augusta Arsenal and Augusta Powder Works fell to Colonel George W. Rains, (Cullum 1113) for the duration of the war. Colonel Rains was a decorated military officer, a West Point Graduate of the class of 1842 who fought in Mexican War and resigned his commission in 1856 to operate his Washington Iron Works in Newburg, New York. He offered his services to the Confederates early in 1861. 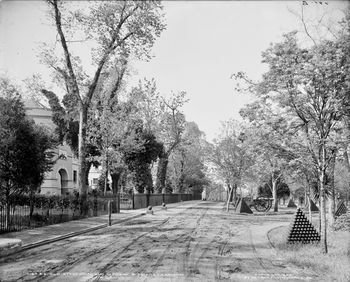 The arsenal was held by Confederate forces until it was surrendered in May 1865. Restored as a Federal arsenal in 1865 and operated until abandoned in 1955. During World War II the arsenal greatly expanded to include some fifty buildings and a thousand workers producing weapons and ammunition. The arsenal was abandoned in 1955 and the property was transferred to the Augusta Board of Education. It eventually became the Junior College of Augusta in 1957. 1838 1838 2d Lt. Metcalfe, John T. 947 Temporary command. 1842 1842 Capt. Williamson, John 451 Temporary command. 1844-01 1844-11-30 1st Lt. Talcott, George H. 639 Temporary command. 1866-01-21 1871-05-24 Capt. Flagler, Daniel W. 1937 In Cullum's Register, dates overlap with the next. 1871-05-05 1873-09-29 Capt. Rollins, James H. 1991 In Cullum's Register, dates overlap with the preceding. 1873-10-15 1875-10-07 Capt. Hill, Richard M. 1939 While commanding post, he was promoted to Major. see the entry in Cullum's Register. He was promoted Major on June 25, 1906. 1911-08-29 1919-03-08 Col. Benét, James Walker 2860 Father of Authors, William Rose and Stephen Vincent Benet. Located on the campus of present day Augusta University - Summerville Campus, Richmond County, Georgia. Some remaining original buildings including officer's quarters. Location: 2500 Walton Way, Augusta University - Summerville Campus, Augusta, Richmond County, Georgia. This page was last modified 19:27, 7 January 2019 by John Stanton. Based on work by Bill Thayer.